Dropbox is the ideal tool if you work with documents on several computers at once. 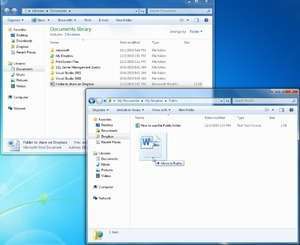 With this Windows application, you can easily synchronize and access data from your account and essentially mount the Dropbox as if it were a hard drive. Compatible with Windows, Mac and Linux, and accessible directly from the File Explorer web browser, Dropbox offers 2GB of free space up on the Internet for uploading all kinds of files, whether songs, photos, videos or documents the text. With Dropbox you will be able to very easily share files across multiple computers, and when you add a new one, it will automatically synchronize with your Dropbox account. Version 69.4.102 is a freeware program which does not have restrictions and it's free so it doesn't cost anything. For security reasons, you should also check out the Dropbox download at LO4D.com which includes virus and malware tests. Additional screenshots of this application download may be available, too. Dropbox has a presence on social networks.